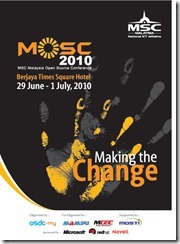 There is something i would write about the event #mosc2010 as a whole. First thing, T-Shirt, they said that 2nd day the price will be RM40, but today, it was still RM30. Who knows Day 3 will be RM20?!? Stupid me. Spammers at twitter….. Someone actually setup a quote bot to try to win the contest. That guy spammed 400 tweet in 3 hours (although there are few of those tweets are genuine, not from bot lah). So annoying…..
Food is good as usual. And, good to know there are MOAR PRIZES for the lucky draw!!! But i was not that lucky today, will wait till tomorrow lol. What else….. pretty much thats all feedback i got for today lah. I enjoyed most of the talks today. Learnt a lot of things…..
And had a wonderful day. Tomorrow Day 3 im very looking forward to it. Good night and follow the liveblog tomorrow! Look out this space starting from 4.30 30/6/2010 for super awesome liveblogging/livetweeting of the event! Thats all, everything else is in the liveblog play back.